When you think of position players, typically they have the select places around the diamond that deem success. Richard Brereton of the Emory Eagles is the outlier. He not only can swing the stick (Sophomore year-1 HR-12 RBI's-.333 average) but he can sure as heck pitch it as well. 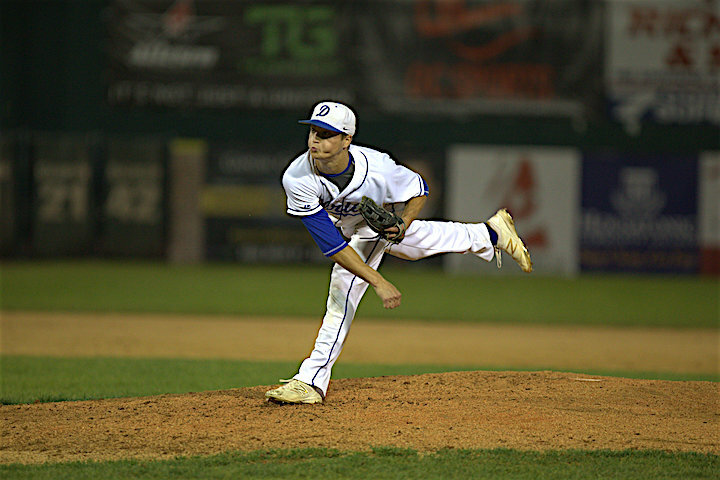 On the mound Brereton has logged 49 innings pitched, 48 hits surrendered, 46-20 K's/BB's, while compiling 4.22 era. In many aspects Brereton can do it all, almost like another player who currently is in the majors playing for Angels (AL). That player is non-other than Shohei Ohtani, and although the season is less than 11 games in he's made doing pitching-hitting look EASY. In 22 at-bats for the japanese import he's batting .364 with 3 HR's and 8 RBI's. On the bump he's 2-0 with a miniscule 2.08 era. While comparing a MLB ball player to a collegiate athlete might seem unfair, but image watching Brereton play an infield position AND pitch in the same game. Wouldn't that be something? Having Brereton on the Blues roster gives manager Ronnie Palmer just another option out of the bullpen. When you combine that with the season being a long grueling battle night in & night out you can use all the arms possible.